Test 6 is today, at the beginning of the timeslot, and will run approximately 14 minutes. As previously announced, the textbook will have a supporting role as you learn new topics from these notes and your classroom sessions. Use the table-of-contents and the index to locate the topic, and then read about it there. A reminder: The textbook does not use view model classes in its discussions and code examples. We do. At this point in the BTI420 course, you have learned the foundations to build interactive web apps that work with persistent data. Now, it’s time to get security involved. This week, we begin a three-week study of security topics, including identity management, authentication, authorization, and interactive workflows/scenarios that involve security. Along the way, you will learn something about Microsoft Azure services, and publicly hosting your web apps. 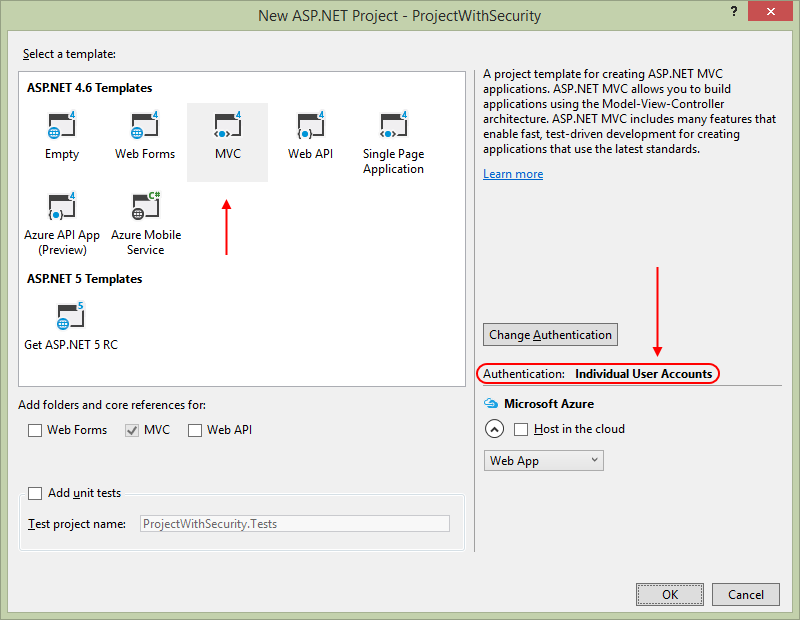 Web apps that you create with Visual Studio use a security system named ASP.NET Identity. Its components provide identity management (i.e. user account creation and maintenance), authentication, and authorization. 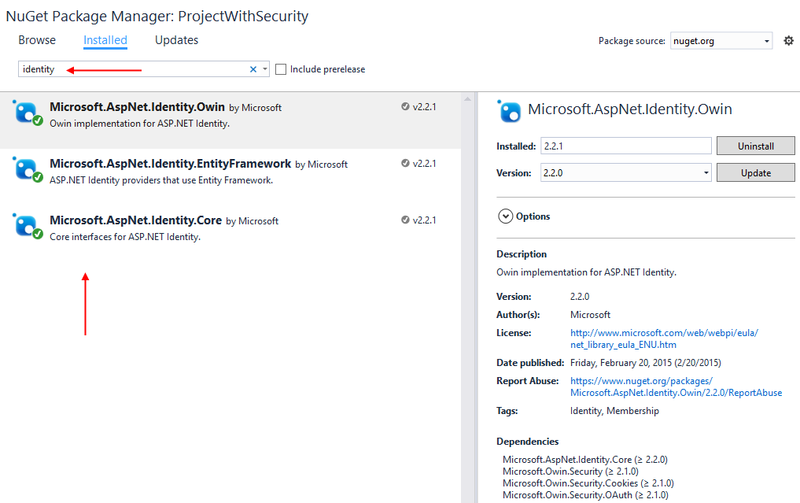 ASP.NET Identity is an implementation of widely-used and standards-based approaches to web app security (OAuth2, and OpenID Connect). A User Account is an object that represents a human user of a web app. A user account includes identification and description properties, including user name, a shared secret (i.e. a password), email address, etc. Authentication is the process of presenting and validating credentials. 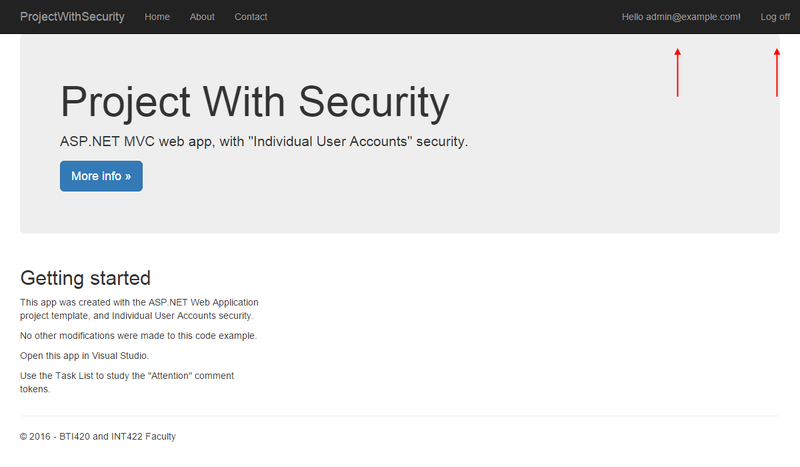 A web app that’s configured to use ASP.NET Identity includes the components needed for authentication, including a login page. The word authentication is often abbreviated to AuthN (or authN). Also, after authentication, the ASP.NET Identity system creates a security principal object, and attaches it to the execution context. Among other data, this object includes claims, which are descriptive pieces of information about the user (as you’ll learn more about soon). The web app returns an authentication cookie in the response to the browser. By convention, the browser will include the cookie in every subsequent request to the web app. After a user authenticates successfully (i.e. logs in), the user’s claims determine whether they are authorized to perform tasks and access resources in the web app. This is the definition of Authorization. The word authorization is often abbreviated to AuthZ (or authZ). This process or workflow will be described in more detail, in a later section of these notes. As a user of the web, you have experience with web apps that have security components. As a web programmer, you have some experience with security-related coding tasks. In BTI320, you designed and created a credential store, to hold usernames and passwords. In addition, you coded a login form, and the credential validation (authentication) process. An access control list based scheme was used to protect resources. A useful experience, but not real-world enough. In this BTI420 course, we will use built-in components for all security tasks. In these components, there are several customization points to handle your app’s unique needs, so you will be introduced to a small number of useful customizations. Do not write your own security infrastructure for web apps. Take advantage of standards-based approaches, and the efforts of many smart and trusted programmers who have created modern security infrastructure components. And, after learning about these topics, if you think you’re smart enough to fix something or make contributions, get involved in the projects already out there on the web. As you work through this section of the notes, open the ProjectWithSecurity sample app. Use the Visual Studio Task List to locate the “Attention” comment tokens. File > New > Project. Select the standard “ASP.NET Web Application”. On the next dialog, choose the “Individual User Accounts” authentication scheme. For the next few weeks, we will NOT use the “Web app project V1” template. Click the image to open it in a new tab/window. We will use this method now, and in the future, for our new web apps. The app will use ASP.NET Identity for identity management and authentication. With Local login, the user can create a user account. The app stores user account (including a password hash) in the LocalDB database, which can be deployed to a hosted and public production environment. Local components perform authentication. With Social login, the user authenticates with an external service, such as Facebook, Microsoft, or Google. The app creates a user account for the user in the local database, but does not store the password hash. For both local and social login, ASP.NET Identity uses standards-based OAuth2 for authentication. The database is managed by the Entity Framework Code First technologies, and all of the tables are represented by entity classes that can be modified. This means that you can easily customize the security- and profile-related data to fit your app’s needs. ASP.NET Identity is a good choice if you are creating a public-facing web site which is mainly for users on the web. Which we are. If your organization uses Microsoft Active Directory or Microsoft Office 365, and you want to create a project that enables single-sign-on for employees and business partners, this method is a good choice. If your organization is creating an internal-facing app, which will be used ONLY by employees who have Active Directory accounts, this method is a good choice. In this section, you will learn how to locate and recognize the ASP.NET Identity components in the web app that you have just created. If you open the NuGet Package Manager, and then search for “identity”, you will see at least three installed packages. Click the image to open it in a new tab/window. The Microsoft-provided components are visible in the NuGet Package Manager, or as “assemblies” in the References branch of your project in Solution Explorer. Notable assemblies include a number of Microsoft.AspNet.Identity assemblies, and others in the Microsoft.Owin.Security group. Look at the Startup class, in the Startup.cs source code file in the root of the project. When the app loads for the first time, it instantiates this class, and runs the Configure() method, by convention. As you can see, that method simply calls the ConfigureAuth() method. The class’ implementation is split over two source code files. (Notice the “partial” keyword in the class definition statement.) The other part of the implementation is in the App_Start/Startup.Auth.cs source code file. Its ConfigureAuth() method loads and configures the security components. In Solution Explorer, open the Models folder. Locate the IdentityModels.cs source code file. Its classes enable the creation, storage, and management of user accounts. 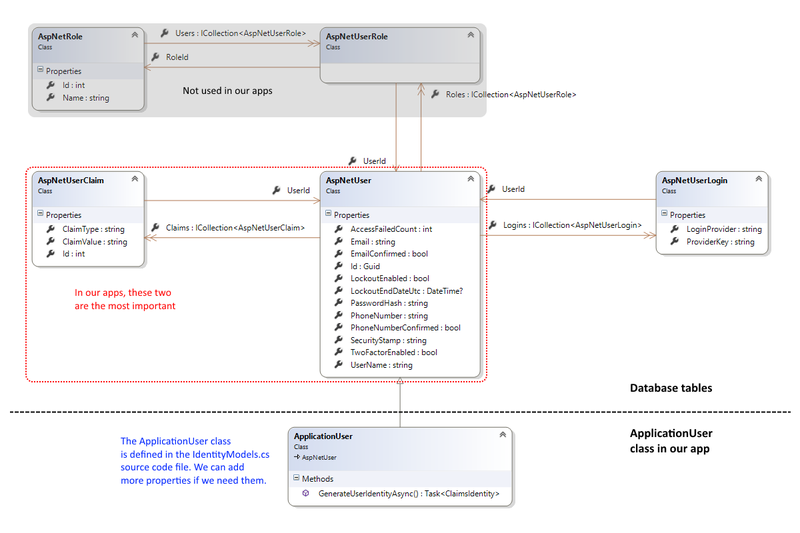 The ApplicationDbContext class manages the persistent data store (the database). We can extend (add code to) this class by adding our own DbSet<TEntity> properties for our web app’s entity collections (that we define in a separate DesignModelClasses.cs source code file). The class inherits from IdentityDbContext<TUser>, and ultimately DbContext, just like the data context that we have been using for the past several weeks. Now, locate the AccountViewModels.cs and ManageViewModels.cs source code files. AccountViewModels.cs includes the classes needed by the “Account” controller (mentioned later) for the user interface views, such as register, login, forgot password, and so on. Typically used for tasks done by unauthenticated users. ManageViewModels.cs includes the classes needed by the “Manage” controller (mentioned later) for the user interface views, such as change password, etc. Typically used for tasks done by authenticated users. If we were to look at a diagram of the classes that are represented in the data store, it would look like the following. Click the image to open it in a new tab/window. In Solution Explorer, open the Controllers folder. The Account controller has actions that enable a user to register for a new account, login, and do other tasks. As noted above, typically used for tasks done by unauthenticated users. Study the Register method pair. They enable a browser user to “register”, or create a new user account. Next, study the view model that support this task (RegisterViewModel). Finally, study the Register.cshtml view (in Views/Account folder). This renders the UI for new account registration. Next, study the view models that support this task (LoginViewModel). Finally, study the Login.cshtml view (in Views/Account folder). This renders the UI for login. The Manage controller has tasks which are done by authenticated users, including password change, and some property value changes. In the Views/Shared folder, there is a new _LoginPartial.cshtml view. It holds markup and code for rendering content on the _Layout.cshtml view. (This appears on the right side of the application’s menu bar.) If the user is authenticated, it displays links that enable the user to manage their account, and logout. If not authenticated, it displays links for new account registration, and login. Let’s get an introduction to each workflow. A new web app (with security) does NOT include any user accounts. In the default configuration of ASP.NET Identity, the user name is an email address. Also, it is configured to be a unique value. Therefore, in summary, it can be reliably used as a unique identifier. We will have more information about this fact later in the course. The password must follow some rules. These are found in the PasswordValidator property, in the Create() method of the ApplicationUserManager class (in App_Start/IdentityConfig.cs). The user accounts that are created all have the same security profile. No account is more powerful or privileged than another. We fix that soon, by using claims. At the end of the new account registration process, the app authenticates you, and you are logged in. Later, after logout, you can use the login page to authenticate. Click the image to open it in a new tab/window. As noted earlier, authentication is the process of presenting and validating credentials. During authentication, the ASP.NET Identity system creates a security principal object, and attaches it to the execution context. Among other data, this object includes claims, which are descriptive pieces of information about the user (as you’ll learn more about soon). Also, the authentication process will create a data package – which is an HTTP cookie – and return it in the response to the browser user. The data package includes information about the authenticated user, but it does not include sensitive or secret data. It definitely includes the user name, and the user’s claims. On subsequent requests from the browser user, the data package – the HTTP cookie – is sent with the request. The browser handles this task automatically. How can you quickly determine whether you have successfully authenticated? Look in the upper-right area of the page. It will show a greeting, and a logout link. Click the image to open it in a new tab/window. You can also use the web browser developer tools – F12 in any browser – to inspect the HTTP cookie. You will see a cookie named “.AspNet.ApplicationCookie“. The browser will include the cookie with every subsequent request to the web app. Here’s an image of the scenario described above. Click the image to open it in a new tab/window. As noted above, when a web app receives a request with an HTTP cookie, the security infrastructure validates the cookie. If valid, it creates an IPrincipal object, and attaches it to the request. That way, information about the authenticated user is available to your code, as the request makes its way through the request-processing pipeline. The user’s claims can determine whether they are authorized to perform tasks and access resources in the web app. On the controller class declaration, and/or on its methods, we can add the [Authorize] attribute. In its simplest form, its presence requires the request (from the browser user) to be authenticated. In other words, it must include the HTTP cookie that indicates that authentication has happened. Soon, you will learn other forms of the [Authorize] attribute, to handle security scenarios that are more real-world in nature. Study the AccountController class. It includes an [Authorize] attribute on the class. This means that a request MUST be authenticated to run any method in the class. However, notice the Login() and Register() methods. They include the [AllowAnonymous] attribute. This means that ANY request will be able to run these methods. Makes sense now, right? In your code, how do you get access to the authenticated user’s information (in other words, its security principal)? A security principal is an object that represents the security context under which the code is running. It can be inspected by your program code, so that you have decision-making information in your code path. The information is in the User property. In a controller, it’s simply the top-level User property. If you want to determine whether a request is authenticated, the Request.IsAuthenticated property will tell you. In the manager object, it’s the HttpContext.Current.User property. If you want to determine whether a request is authenticated, the HttpContext.Current.Request.IsAuthenticated property will tell you. Yes. Open the SecurityIntro code example, in Visual Studio. Study the code as you continue with the following tasks. The “Attention” comment tokens (on the Task List) are numbered, so sort the list, and go through them in sequence. Run the app. Create a new user account, and login. Then, use the nav menu links to perform the tasks on the menu. Notice that you have access to some information, and notice that you do not have access to other content. We have created this summary table as a quick reference for the components, responsible entity, and code assets and tasks involved in security. Above, you learned that the user accounts that are created in an app that uses ASP.NET Identity all have the same security profile. No account is more powerful or priviledged than another. That’s a problem. A big problem, for real-world applications. Most apps need user accounts with different security profiles. Use claims. Claims are the key to modern claims-based security. A claim is a a statement that one subject makes about itself or another subject. Therefore, a statement is descriptive information about a subject. A subject is a participant in the lifetime of an application. A subject could be a human user, or a corporate body, or a programmable object (e.g. a security provider). What does a claim (statement) look like? The claim type is a string. There’s a list of standard, predefined, or “well known” claim types, which are URIs. Here are some examples; assume that the subject is a user (and your professor), Peter McIntyre. URI is defined in RFC 3986, and was updated by RFC 7320. Known informally as “name”, which is the last segment in the URI. Known informally as “dateofbirth”, which is (again) the last segment of the URI. Known informally as “role” or “role claim”. A claim type string can also be a simple string, and not a URI, if you are defining a custom claim type for local use within the app or the app ecosystem. Here are some examples. The user’s full (readable) name (e.g. first name, and last name) is Peter McIntyre. The user’s driver’s license number is M12345809515. While a claim is a statement about a subject, claims are managed and issued by an identity authority (which is the ASP.NET Identity system in our web app). Then, a claim can be used by an application to authorize a user to access resources and/or perform tasks. For our web app, claims are packaged in an authentication cookie, after a user successfully authenticates. Therefore, the result of a successful authentication is a cookie that (among other data) includes claims. Open the SecurityClaimsIntro code example. Run the app, and study the code. The “Attention” comment tokens (on the Task List) are numbered, so sort the list, and go through them in sequence. Above, you learned about the essential security topics – identity management, authentication, and authorization. You were introduced to the ASP.NET Identity system, which “plugs in” to your web app. Then, you learned a number of introductory security configuration and use tasks. In the next few weeks, we will continue learning more about writing security-aware web apps. Along the way, we will learn how to create our own data model, and host our web apps at a hosting service. Please note that this week’s second class/session (in the computer-lab room) will NOT happen. Why? We’re having a mid-term break, to catch up, refresh, and review. Please do the tasks that are described in the “Advice about success in this course” section of the February 1 notes. So, no class/session on Friday, February 24, or Monday, March 6. Our next class/session will be next Wednesday, March 8, 2017.